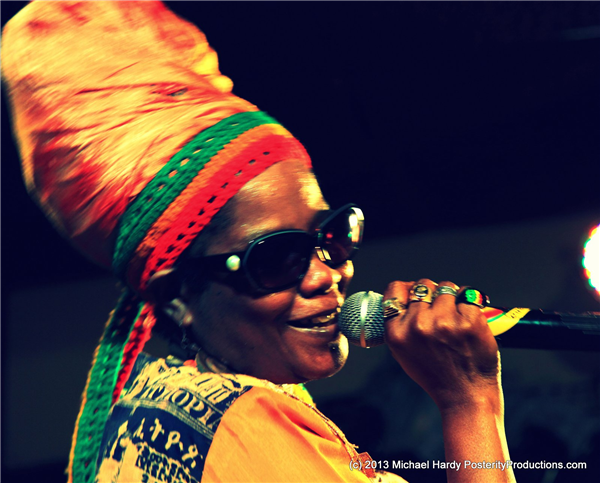 Reggae’s reigning queen, for nearly three decades, Sister Carol has been a trailblazer for women in reggae. She is a Grammy-nominated singer, DJ, songwriter, actress, entrepreneur, educator and humanitarian whose work is infused with social consciousness and rich with Jamaican cultural heritage—so much so that she is often referred to by fans and peers as “Mother Culture.” Born Carol Theresa East in 1959 in Kingston, Jamaica’s Denham Town ghetto, in the midst of the exploding Jamaican music scene, her father was an engineer at Radio Jamaica Rediffusion and the legendary Studio One. At 14 her family emigrated to Brooklyn and the thriving NYC dancehall scene. After winning talent contests in both Kingston and New York, Sister Carol was offered an opening slot for one of Jamaica’s finest vocal trios, The Mediations, who had been the harmony backup vocal ensemble for Bob Marley. This opportunity opened the door for her to record 1983’s Liberation for Africa and 1984’s Black Cinderella, which established her firmly in the dancehall/DJ movement. In 1989 she established her own Black Cinderella Record Label. She’s garnered a Grammy nomination for Best Reggae Album, earned a college degree, raised four kids and doted over six grandchildren, acted in many films such as Rachel Getting Married, and started her “Black Cinderella” clothing line. She also appears in the Bob Marley documentary Stay with the Rhythm. Sister Carol’s 12th and latest album is Live No Evil.